I measure the memory before I start the window manager (WM) or desktop environment (DE). I do another measurement after, and I have the amount of RAM required to run the desktop. It is an idle desktop with only the default tasks envisioned by the developers. Everything runs in a LXC container set up with virtenv. The computer I am using is a 64bit Debian 7 system, with WMs and DEs as distributed by Debian stable. 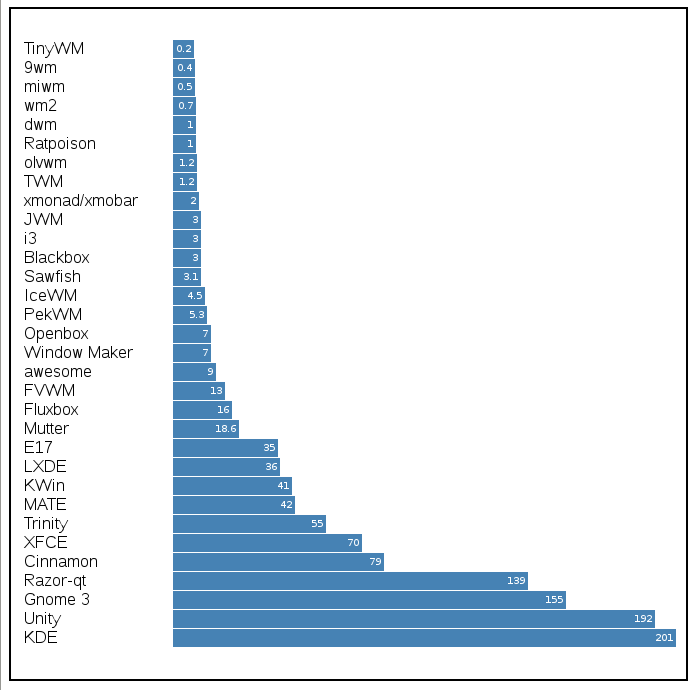 If you are into “less memory is better”, you definitely need to check out TinyWM. 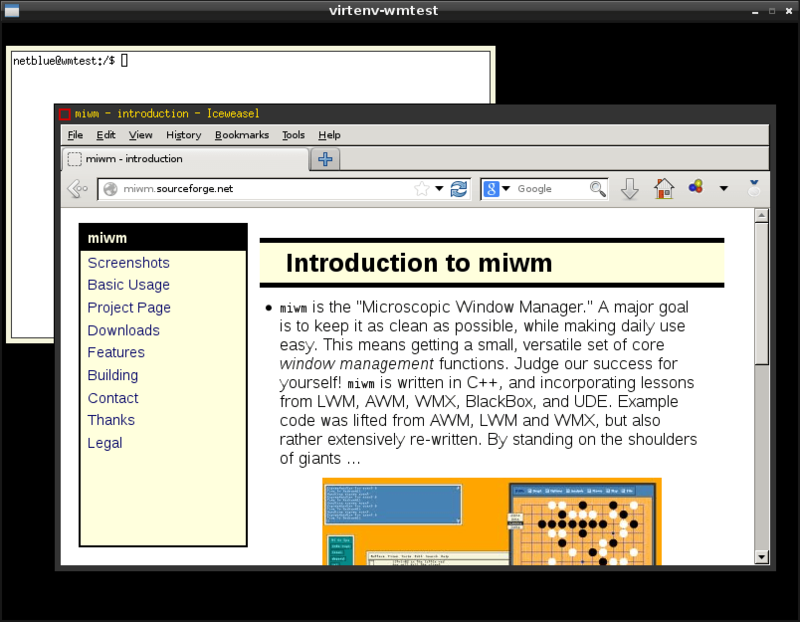 Written by Nick Welch in about 50 lines of C code, TinyWM is a “ridiculously tiny window manager”, used to serve as a basic WM programming example. You might also want to check on developer’s webpage the Python version, Lisp version, and Ada version. TinyWM will move, resize, focus, and raise your windows. There are no window decorations, it looks just like regular X. On Debian/Ubuntu install TinyWM as apt-get install tinywm. Start it as tinywm. It runs in less than 0.2MB of memory. From tiny we move to microscopic. miwm (Microscopic Window Manager) implements a small, versatile set of core window management functions, with the goal of keeping the window manager as clean as possible. You would need to supply your own launcher, taskbar and menus using external programs. On Debian/Ubuntu install miwm as apt-get install miwm. Start it as miwm. It runs in 0.5MB of memory. Around 1.2 MB things get shiny. OPEN LOOK Window Manager was the default window manager in SunOS and Solaris. 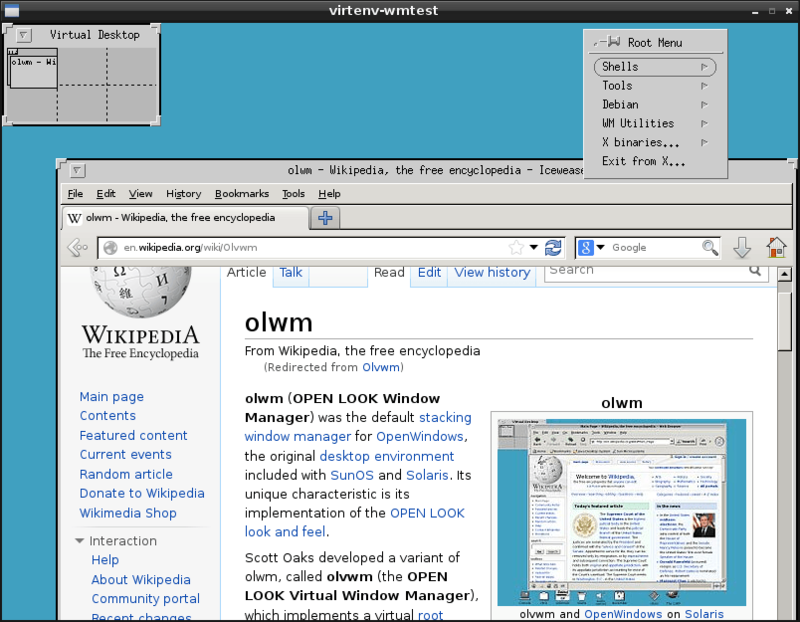 The open-source version is olvwm (OPEN LOOK Virtual Window Manager), developed by Scott Oaks. It implements a root window with dimensions greater than those of the video display, and it works on any X11R5 or X11R6 systems. Install olvwm in Debian/Ubuntu as apt-get install olvwm. Start it as olvwm. It runs in 1.2MB memory. As more and more features are added, the memory increases. 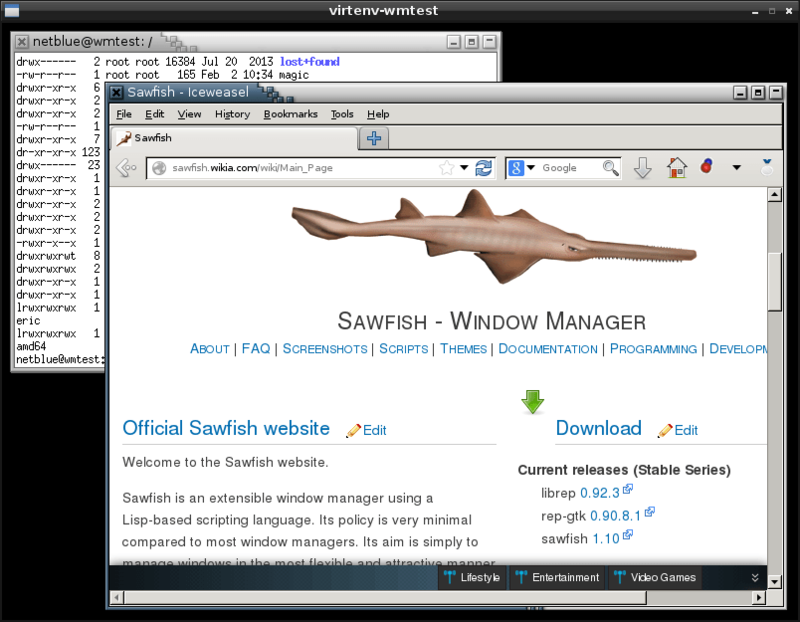 This time we look at Sawfish, a themable window manager using a Lisp-based scripting language. Providing only window manager capabilities and nothing else, Sawfish is usually combined with other programs such as wbar or LXPanel. On Debian/Ubuntu install sawfish as apt-get install sawfish (yum install sawfish on Fedora). Start it as sawfish. It runs in 3.1MB of memory. 4.5MB of memory later we have a window manager with taskbar, menus, network and CPU meters, mail check and clock. This is IceWM, a fast and simple window manager. It comes with a number of themes that allows it to imitate Windows 95, Windows XP, Windows 7, OS/2, and Motif. On Debian/Ubuntu install IceWM as apt-get install icewm (yum install icewm on Fedora). Start it as icewm. It runs in 4.5MB of memory. 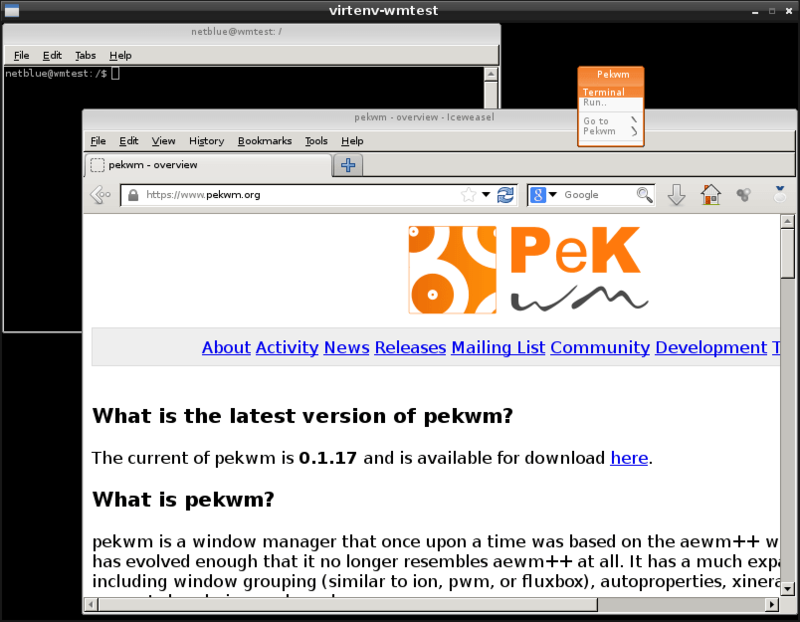 PekWM (The Pek Window Manager) is a window manager based on aewm++. It supports window grouping, auto properties, xinerama, keygrabber, keychains, and much more. On Debian/Ubuntu install PekWM as apt-get install pekwm (yum install pekwm on Fedora). Start it as pekwm. It runs in 5.3MB of memory. 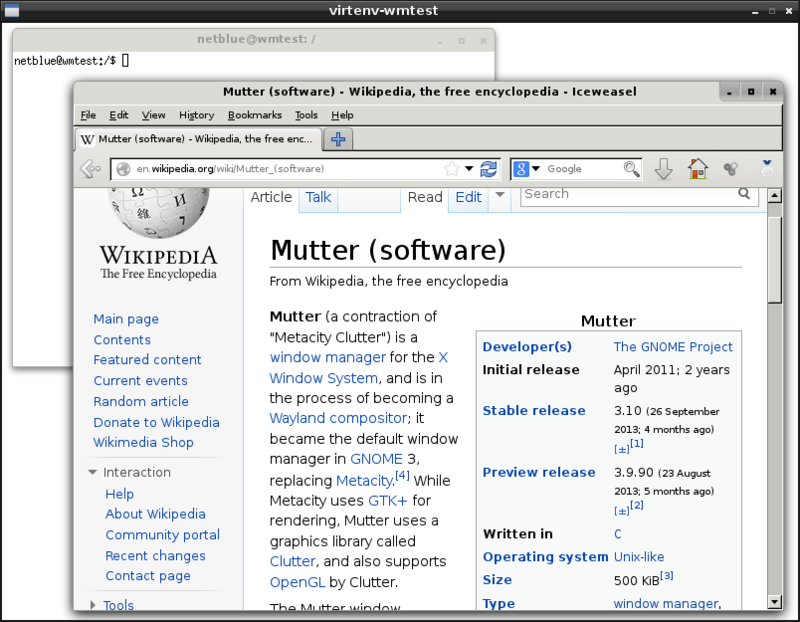 Mutter (Metacity Clutter) is the current Gnome 3 window manager. Based on Clutter library, Mutter supports OpenGL and a large number of visual effects. Today, Mutter is in the process of becoming a Wayland compositor. Mutter is an excellent choice for building Gnome-like desktops. Give it a try if you are into Gnome 3 look and feel, but you don’t like the functionality Gnome Shell has to offer. On Debian/Ubuntu install Mutter as apt-get install mutter (yum install mutter on Fedora). This will bringing in over 50MB of various Gnome-specific packages on your hard disk. Start it as dbus-launch –exit-with-session mutter. It runs in 18.6MB – I’ve tested it on a Nvidia card running Nouveau driver. 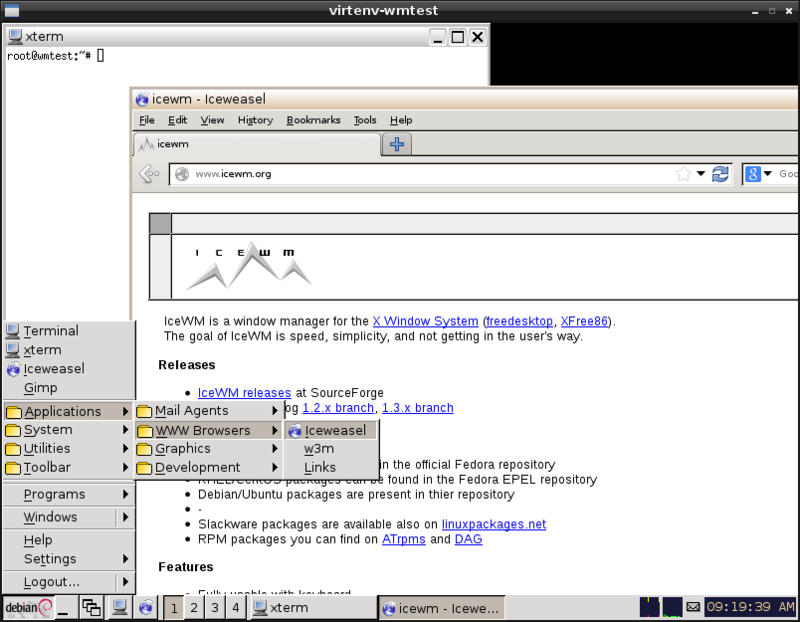 KWin is the default window manager in KDE desktop environment. It is a compositing window manager, currently available backends include XRender and OpenGL. Like Mutter, KWin is also in the process of becoming a Wayland compositor. 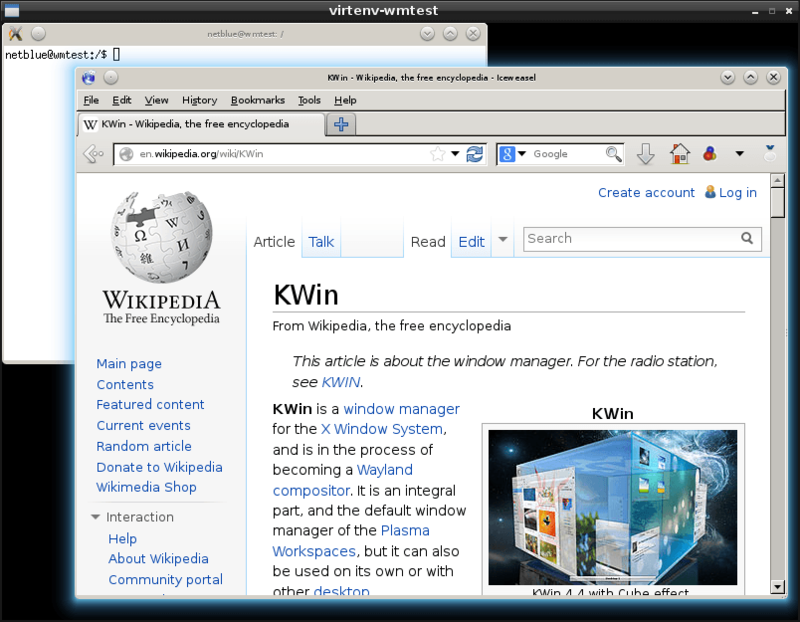 On Debian/Ubuntu install KWin as apt-get install kde-window-manager (yum install kwin-gles on Fedora). This will bring on your hard drive over 170MB of various KDE packages. Start it as dbus-launch –exit-with-session kwin. On my computer it runs in 41MB of memory (Nvidia card, Nouveau driver). In 2MB of memory you get tiling window managers suitable for power users and vi experts. Around 10MB you have a bunch of themable window managers with taskbars and menus. For many users this is enough, although we are still in power user territory. OpenGL-enabled window managers start around 20MB and bring in shadows, transparency and lots of cool visual effects. From 40MB up we have the classic lightweight desktop environments. These DEs are becoming more and more popular as computer hardware update cycles lengthen. The latest and greatest cutting-edge desktop features can be found starting from 150MB. It’s nice to see someone mention OLVWM. It was my first X window manager, on SunOS 4 in 1992. I wonder how Compiz would fare. I think Compiz was removed from Debian, I’ll look into it! The links to part 1 and 2 re broken. Also, the graph looks bad. How comes that “3” looks like just a tiny bit more yhan “0.2”? > The links to part 1 and 2 re broken. > Also, the graph looks bad. How comes that “3″ looks like just a tiny bit more yhan “0.2″? Alikazaam-anformation found, problem solved, thanks! Didn’t expected mate to be that light, i always thought that xfce was lighter… man i was so wrong. With the snapping feature of the 1.8 version of mate, i might really switch for mate now. Thank you dude for the comparison. Hello can you add subtle ? Yes, I’ll do it in the next article. It is coming in the next installment. First of all: I really like the approach you take for the measurements. On Fedora one should not use kwin-gles but rather the kde-workspace package which provides KWin. kwin-gles is a variant compiled against OpenGL ES which does not work on all hardware. Last but not least from the taken approach I assume that KWin is using the XRender compositor and not OpenGL which could have some effects for memory usage. When KWin detects llvmpipe it switches to XRender and should restart to switch from raster to native Qt graphicssystem. This means the memory usage could be different to real world conditions. I do not know whether the Qt graphicssystem has any impact but given the way Oxygen works I wouldn’t be surprised if that’s the case. On the other hand an OpenGL context is about 10 MB which are missing in this setup. What I would find interesting is to see how the WMs scale with number of windows. At the moment it’s just the startup. Unsurprisingly the ones starting a compositor or link a lot of libraries need a lot of memory in startup. But how will that change with many windows? My expectation is that the composited WMs would require more memory per window due to the compositing overhead. Hi Martin. Thank you for your comment and for all the work you are doing in KWin. I’ve done the testing on Debian with a Nvidia card and Nouveau driver. 41MB is a very good number for a modern, hardware-accelerated window manager. 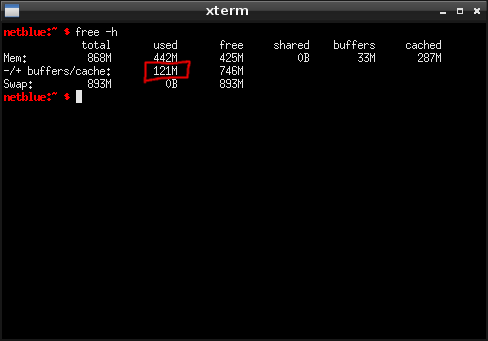 Probably one can get this memory footprint down by removing some of the KDE/Plasma libraries that are preloaded. This could help a lot the people who are using KWin standalone. Also, there is a huge interest in using KWin and Mutter in other desktop environments like LXDE or XFCE where KDE or GTK3 libraries are not needed. Anyway, it is a easy way to get a beautiful modern look for your desktop without having to run a full KDE or Gnome stack. I think in my setup KWin is using the XRender and not OpenGL. The VM is based on Linux namespaces. When playing games, I’m getting similar framerates in VM and on the host, it definitely is hardware accelerated. For KWin/5 we got rid of quite some of the libraries thanks to frameworks. But our first release still links plasma framework which in turn links a lot of further frameworks. The long term goal (maybe 5.1) is to have the plasma dependency only during runtime through QML. In a Plasma environment it wouldn’t matter, on other environments it would be easily possible to ship other QML files. Thank you Martin, much appreciated. I would love to see how WMFS does compared to others tiling WM (especially Awesome). Any plan on testing it? Thank you for your suggestion. I’ll include it in the next installment. Is Sway https://swaywm.org a light windows manager ? E17 is now Moksha ?